CALMS staff and representatives see themselves as equippers of equippers! At its inception, CALMS made the deliberate decision to be a relational, servant organization that remains close to the congregations that it serves in the United States. After over 15 years, CALMS continues to be a grass-roots mission agency that seeks to work as closely as possible with our US and Central American partners -- not as "them and us," but as "us together and with God," in order to accomplish His mission. CALMS follows a management style that focuses on 1) Low Control; 2) High Accountability; 3) High Efficiency and Right Results; and 4) Light Weight and Low Maintenance. In order to reduce adminstrative costs, CALMS' full-time staff members, adjunct staff and volunteers work from their home offices and in the field using technology such as Web Ex, SKYPE, and other tools to communicate with each other and with partners around the USA and Central America. Dr. B. Steve Hughey, former missionary, Spanish Lutheran Hour director, mission executive, church planter, and parish pastor who serves as Executive Director. Rev. Miguel Torneire, originally from Brazil and former missionary to Guatemala, serves as CALMS' director of operations in Central America. Dawn Timm, former missionary to Russia and to Jewish people in New York City, who serves as CALMS' logistics coordinator and business manager. Lori Newhouse is CALMS' director of development and partner relations. Chris Rodgers works as CALMS' coordinator of discipleship and housing in Belize. Cheryl Haun works as CALMS' coordinator of educational training in Belize. 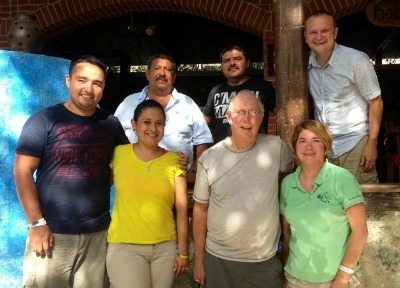 Lay Missionaries include Charles Cohen in Guatemala and Peg Wolfram in Belize. Guatemalan representatives who work with our mission teams and guide relationships with local partners include Ramiro Penate, Nilss Morales, Alex Cerna, Karla Pena de Cerna, Dr. Elry Orozco, and Ana Lily Schwendener. Each year CALMS also sends a number of student interns to serve with our Central American partners. Presently, DCE Intern Emma Clifford from Houston, TX, is serving as an 18-month intern in Zacapa, Guatemala.